To browse recent applications, from any screen, say “RECENT APPLICATIONS”. After a moment, numbers will appear in the upper right corner of each open app. Use the “PAGE DOWN” and “PAGE UP” commands to scroll through open applications. 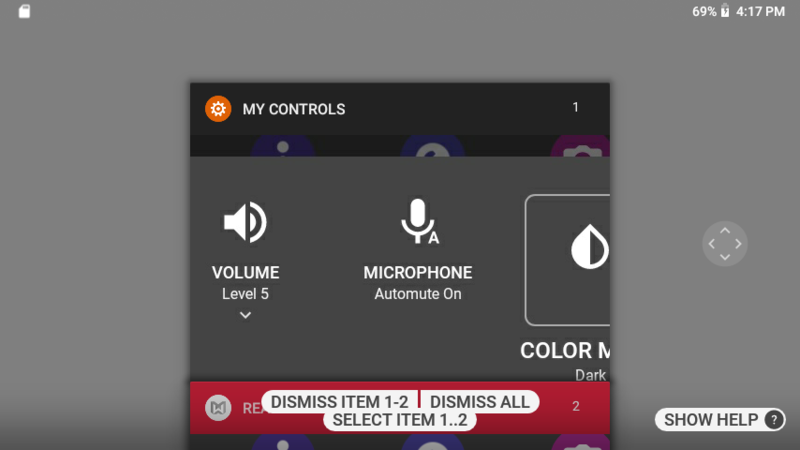 Select an app to open by speaking the name of the application, or use the “SELECT ITEM #” command, referencing the number in the upper right corner. “RECENT APPLICATIONS” Displays the list of all the applications running in the background, along with the item number associated with each application. “PAGE UP” Scrolls to the previous page of recent applications list. “PAGE DOWN” Scrolls to the next page of recent applications list. “SELECT ITEM 1” “SELECT ITEM 2” “SELECT ITEM 3” … Opens the application associated with the specified item number. “DISMISS ITEM 1” “DISMISS ITEM 2” “DISMISS ITEM 3” Stops the application corresponding to the specified item number. For example, to stop the application associated with item number 5, say “DISMISS ITEM 5”. “DISMISS ALL” Stops all currently running applications.